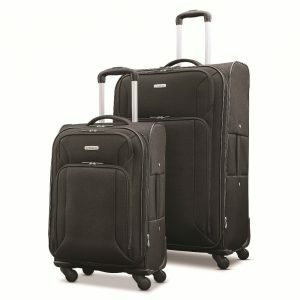 Samsonite Victory (103034-1041) is a two-piece modern, stylish, reliable, functional and sturdy soft side luggage set. The 600D polyester fabric is used on the exterior body which makes it solid and lightweight. The quality of the material, zippers, finishing and the telescoping handle are better than average. It is easily maneuverable with the four 360-degree spinner wheels that rotate in different directions. 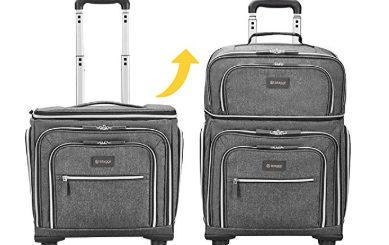 You can push and pull the suitcases smoothly and effortlessly on their solid spinner wheels by holding the locking and adjustable retractable contoured telescoping handle that will fit your hand nicely. There will be no weight or burden on your arms. The small cabin bag that weighs 7.12 pounds and measures 21 x 14.25 x 8.5 inches without the wheels can be expanded by another 0.65 inches. 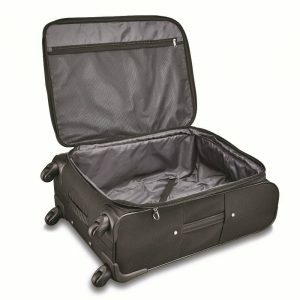 And the large 29” spinner with the dimensions of 29 x 19.5 x 10 inches is expanded by 1.25 inches, giving you some extra space for packing your belongings. You need to check in the large 29-inch suitcase at the airport but being lightweight it will let you pack more of your stuff in. And the 21-inch cabin bag meets most of the domestic and global airline weight restrictions and is great for taking with you on your short trips. Samsonite is one of the best known global brands in the luggage industry and has a range of products including backpacks, laptop bags, casual bags, and suitcases of different sizes and travel accessories. You can rest assured the wheels will not pop off after a couple of use and that it will protect your laptop and other stuff, contrary to the negative reviews on Amazon.com. You can have a peace of mind that the suitcases will hold up well to all kinds of pressure over many journeys. You’ll find the fully lined interior with a zippered mesh pocket on one side and the elastic tie-down cross straps on the other side and you can organize your items neatly. You may purchase it in either black or navy blue which looks more like light blue in photos and offers the advantage of being seen easily on a crowd of suitcases on a luggage carousel. There is a discreet ID tag on the rear of the large and small bag for you to put your details on in case you lose them. The vinyl piping on the top corner will help reduce wear. The Samsonite Victory Set is offered with an impressive warranty of ten years by Samsonite as a backup of its good build quality. If you don’t keep your expectations very high you’ll be satisfied with your purchase of this two-piece luggage set. The price is not high for the Samsonite quality and you’re getting pretty decent value for money. Samsonite brand bags can often cost a lot and in terms of reliability and functionality, this one is not that much worse.